This template is only at the conceptual stage. Intent is to create a wiki that can dynamically keep track of daily tasks for an individual or, at a later stage, possibly even for a whole group or team of people. A basis may be some of the work done on the Event Calendar template and Issue Tracker template. Take a look at the http://issuetracker-template.wikidot.com which has a section for managing daily tasks. Very basic but it may help. We're using this internally. I assume you'll have one-off tasks and daily tasks. Each task is a page with comments and state tags? Each day is a page? 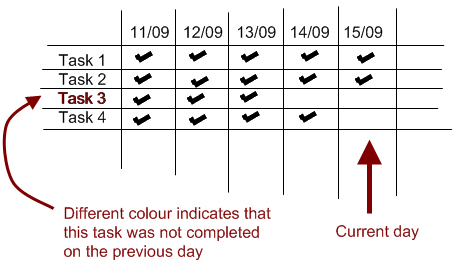 Day page shows both repeating tasks, and pending prioritized one-off tasks. Anyone can take any task…? For one, tasks shouldn't have any comments attached to them. Also, no-one needs to "take" a task, but can simply mark it as done. I don't think there's any assigning of tasks needed… that's what the Issue Tracker is for, in a way. This also dovetails nicely with the project management template where I am putting in an actions page (http://project-template.wikidot.com/actions:_start) but ideally need outstanding actions/tasks on the dashboard. I'll have a think how your concept can be developed Shane. If something should occur weekly every friday, then _fri is added as a tag. If it should occur daily, then all 7 tags are added. As for determining whether or not a task has been completed for a given day.. that's the main problem I can't think of a solution for. It needs to not only remember the current state (done / not done), but also the state for each day in the past as well.